Meconium Aspiration Syndrome (MAS) is the term used to describe a spectrum of disorders, marked by various degrees of respiratory distress in the new born infant. This follows the aspiration of meconium stained amniotic fluid (MSAF), which can happen either antenatally (2.8% of all pregnancies) or during birth (up to 23% of all pregnancies) (1). Meconium is the dark green, sticky and lumpy faecal material produced during pregnancy. It is usually released from the bowels after birth, but in 8-25% of pregnancies, the baby can pass meconium in utero, leading to MSAF. Of these, 5-12% of babies can aspirate MSAF and develop MAS (2,3). When this happens, MAS can cause the new born to develop respiratory distress which may be life threatening. It is still an important cause of morbidity and mortality amongst neonates (4,5). Also, MAS can lead or exacerbate other neonatal complications such as neonatal sepsis and ischaemic insults (6,7). MAS is highest amongst infants who are post term, had thick meconium at birth and suffered birth asphyxia (5). MSAF is the after-effect of in-utero peristalsis. In term or post term infants, where gastrointestinal maturation is appropriate, this movement leads to meconium passage. The peristalsis usually is the result of foetal hypoxic stress or vagal stimulation due to cord compression (8). There is also some evidence that chronic hypoxia may lead to it as well. These factors can also lead to fetal gasping which results in MAS. The pathophysiology of MAS is complex. It depends not only on the meconium’s varied chemical composition (the inflammatory interactions of which are not fully understood) but other factors affecting the neonate’s health as well, such as fetal hypoxia and airway obstruction. However, once aspirated, it can stimulate the release of many vasoactive and cytokine substances that activate inflammatory pathways, as well as triggering vasculature changes. It also inhibits the effect of surfactant in the lungs. Partial or Total Airway Obstruction: Due to its thick and sticky consistency, meconium can cause partial or total mechanical airway obstruction. This leads to a decrease in pulmonary ventilation of the small airways. This may lead to atelectasis and a “ball-valve” effect with air trapping. Currently, there is evidence that there is little correlation between the presence of meconium in the trachea and clinical signs of severe MAS (9). Once the airways are obstructed, the pulmonary pressure increases, leading to right-to-left shunt (through a patent ductus arteriosus or foramen ovale) (See section on Congenital Heart Diseases). This creates a V:Q mismatch, leading to a downward spiral of severe foetal hypoxia. Foetal Hypoxia: Foetal hypoxia results from a myriad of reasons in MAS: a V/Q mismatch, increase of pulmonary vascular pressures, mechanical obstruction, airway oedema and/or surfactant inactivation. All these can cause a decrease in gas exchange and a drop in foetal oxygen saturations. Although it is an important factor to consider in MAS (as it prompts the clinicians to react quicker to the patient) it is neither the cause nor the determinant factor in the severity of MAS in ¾ of the cases (9). Pulmonary Inflammation: Meconium contains many pro-inflammatory cytokines such as tumour necrosis factor (TNF) and interleukins that directly and indirectly contribute to lung tissue injury, surfactant inactivation and infection. Infection: The inflammation process predisposes the foetal lung to an increased risk of infection and can cause a chemical pneumonitis. (N.B. even though both are usually considered sterile, meconium has been shown to be a good medium for microorganisms to grow in compared to clear amniotic fluid). Surfactant Inactivation: The inflammatory reaction caused by meconium deactivates surfactant which increases the surface tension of the alveoli (10). This reduces the efficiency of gas exchange and in turn further exacerbates foetal hypoxia. Persistent Pulmonary Hypertension (PPHN): PPHN results from remodelling of the pulmonary vascular bed in response to hypoxia, vasoactive mediators in the meconium and ventilation/perfusion mis-match. PPHN is one of the major causes of morbidity and mortality in MAS (11,12). The above factors all contribute to and cause lung injury leading to foetal hypoxia and respiratory distress (13, 14). A diagnosis of MAS is difficult given the non-specific presentation of respiratory distress on examination at birth (which often overlaps with other conditions). Having said this, it is still a clinical diagnosis. A full history of the risk factors, confirmed presence of meconium in the amniotic fluid and aspirated meconium (clinical signs of post-maturity and MSAF staining) are necessary to diagnose MAS in an infant presenting with respiratory distress where no other diagnosis can be confirmed ie. MAS is a diagnosis of exclusion. Further diagnostic features are the result of investigation findings below. Arterial Blood Gas – this will allow reliable assessment of the neonate’s pH, Pa02, PaCO2 and any developing metabolic acidosis. A sample is usually taken from an indwelling umbilical artery catheter or peripheral arterial line. Arterial puncture could be used as a last resort. Dual Pulse Oximetry – Oxygen saturations should be measured in the right upper limb and on and either lower limb (pre- and post-ductal) to determine hypoxia and assess any potential right-to-left shunts that may be present. A difference of 5-10% between the limbs is clinically significant of neonatal pathology. Causes respiratory distress similar to MAS but more often seen in pre-term infants. The infant will likely need some ventilator and oxygen support. This may be differentiated from MAS if no MSAF was seen at delivery. Blood gases shows hypoxaemia and acidosis. This can be present on its own or in combination with MAS. The newborn has persistent hypoxaemia causing respiratory distress. Causes of PPHN need to be investigated e.g. PDA with pre-ductal and post-ductal oxygen saturations. Management of MAS depends on the severity of respiratory distress the newborn is experiencing; while some patients born with MSAF may need no extra support, infants experiencing mild to severe respiratory distress will often require specialist ventilatory support, antibiotics and surfactant. Careful observation for respiratory distress needs to be taken with newborns born in MSAF, with particularly close watch over oxygen saturations. As you will see below, most individual treatment options have only a modest impact on MAS morbidity and mortality. However, as mortality is decreasing in developed countries, bedside observations and decision making has been shown to be an important contributor to the child’s positive outcome (5). Blood glucose, UE, FBC, CRP and calcium may need to be assessed and corrected if necessary to exclude other treatable pathologies. Nutritional support should be commenced on day one in the form of IV fluids. The aim should be to switch to nasogastric and oral feeds when permitting. Via nasal cannula to achieve O2 saturations of 92-97%. This can be weaned if the baby is not showing signs of respiratory distress or is clinically improving. Continuous Positive Airway Pressure (CPAP) should be started with nasal prongs in newborns with spontaneous breathing and good respiratory effort. CPAP has many side effects such as air trapping and so close monitoring via regular CXRs is advised. If the above measures are not effective, infants can be intubated and mechanically ventilated. These infants should be managed in a Level 2 or greater NICU centre. If confirmed refractory pulmonary hypertension is seen, the child can be ventilated with inhaled Nitric Oxide (iNO), see below. Antibiotics are usually indicated in infants born who have clinical suspicion of infection. Antibiotics can be stopped if the 48hr cultures and clinical examination findings are negative. The antibiotics usually prescribed are dependent on the unit’s local guideline. (I.e. : ampicillin IV 50-100mg/kg/day and gentamicin IV 4-5mg/kg/day) In MAS, the evidence shows that routine administration of antibiotics does not reduce its morbidity or mortality (16). A bolus of surfactant may be administered in newborns with moderate MAS or if a pneumothorax is present. In severe cases a lung lavage with surfactant can be performed but this needs to be carried out by an experienced specialist and is very rarely required. It can decrease the need for extracorporeal membrane oxygenation therapy (ECMO) but does not reduce the mortality or morbidity of MAS (17). In newborns requiring mechanical ventilation and surfactant there is often pulmonary hypertension also present which requires iNO. This should be given under close monitoring in a tertiary centre, and the patient should be investigated for right-to-left shunts e.g. dual-pulse oximetry, echocardiography etc. The idea that steroids will reduce the inflammation on the lungs has been trialled with various successes. At present it is neither routine practice nor a recommended adjuvant. 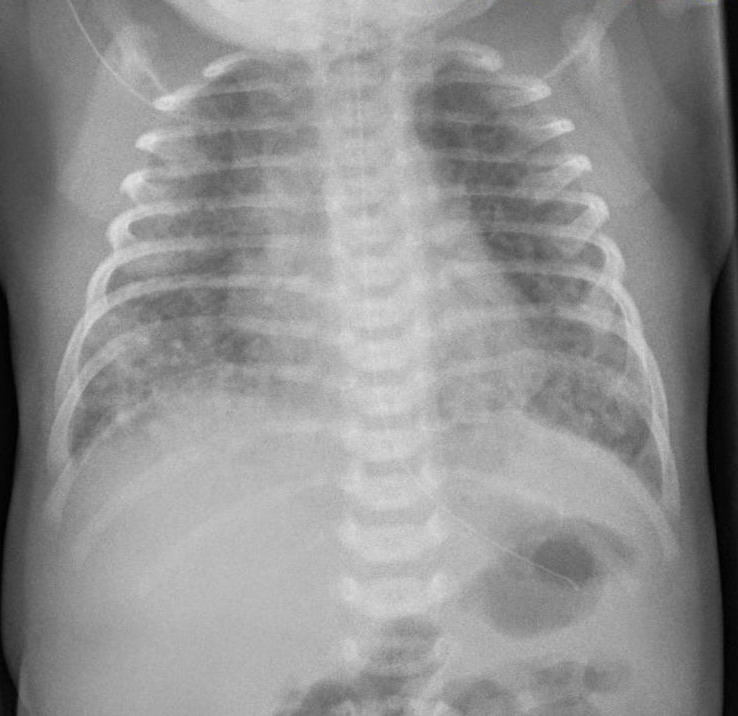 Due to thick meconium sometimes causing a “ball-valve” effect, air leaks can occur due to alveolar hyperdistention leading to a pneumothorax or a pneumomediastinum. There needs to be a high index of suspicion in any MAS new born with compromised pulmonary or cardiac function. Prompt investigation and treatment, such as needle aspiration or continuous drainage, needs to be performed in order to stop further hypoxia and PPHN. Air leaks have a greater incidence when mechanical ventilation is used. PPHN can be either a result, complication or a differential diagnosis for MAS. Around 1/3rd of new born MAS patients have associated PPHN and it contributes significantly to the mortality of the condition. As previously stated, echocardiography for investigation and iNO for treatment should be performed. MAS can lead to cerebral hypoxia resulting in cerebral palsy and other neurological conditions. Relevant brain imaging such as an MRI should be performed in these cases. CLD can develop from barotrauma and oxygen toxicity, amongst other things. Thus, MAS new-borns that have required mechanical ventilation with increased pressures and prolonged oxygen exposure are at high risk. Close monitoring of oxygen saturations and re-assessing the need for oxygen and potential to step down ventilatory measures can help reduce the likelihood of developing CLD. Meconium Aspiration Syndrome can be a fatal condition for at risk term babies, born in meconium-stained amniotic fluid. Immediate assessment and treatment needs to be instigated to reduce the complications and mortality of the condition. Around 80% of new-borns with MAS have a 3-4 day illness and are safely discharged home. The remaining 20% often require interventions in a Level 2 NICU centre or greater due to their increased respiratory and cardiovascular requirements. 1 Argyridis S, A. S. (2016). Meconium stained amniotic fluid. OBSTETRICS, GYNAECOLOGY AND REPRODUCTIVE MEDICINE. 2 Crisp S, Ragubathy K, Niroshan M. Paediatrics. In: Baldwin A, Hjelde N, Goumalatsou C, Myers G, editors. Oxford Handbook of Clinical Specialties. 10th ed. : Oxford University Press; 2016. p. 98-73. 3 Fischer C, R. C. (2012). A population-based study of meconium aspiration syndrome in neonates born between 37 and 43 weeks of gestation. Int J Pediatr. 4 CHETTRI S, B. V. (2016). Current concepts in the management of meconium aspiration syndrome. Indian Journal of Pediatrics, 112-1130. 5 VAIN NE, B. D. (2017). Meconium “aspiration” (or respiratory distress associated. Seminars in Fetal & Neonatal Medicine, 214-219. 6 HUTTON EK, T. J. (2014). Consequences of meconium stained amniotic fluid: What does the evidence tell us? . Early Hum Dev, 333-339. 7 Hofer N, J. K. (2013). Meconium aspiration syndrome- a 21 years experience from tertiary care center and analysis of risk factors for predicting disease severity. Klin Padiatr, 383-385. 8 POGGI SH, G. A. (2009). Pathophysiology of meconium passage into the amniotic fluid. Early Hum Dev, 607-610. 9 Ghidini A, S. C. (2001). Severe meconium aspiration syndrome is not caused by aspiration of meconium. Am J Obstet Gynecol, 931-938. 10 Donn SM, D. J. (2009). Surfactant replacement therapy in the neonate: beyond respiratory distress syndrome. Respir Care, 1203-1208. 11 Abman SH, H. G. (2015;). Pediatric Pulmonary Hypertension : Guidelines from the american hearrt association and american thoracic society . Circulation , 132:2037-2099. 12 Vain NE, S. E. (2009). What (not) to do at and after delivery? Prevention and management of meconium aspiration syndrome . Early Hum Dev, 621-626. 13 Vidyasagar D, Bhat R. Meconium aspiration syndrome. June 2018; Available at: https://bestpractice-bmj-com.ezproxy4.lib.le.ac.uk/topics/en-gb/1185, July 2018. 14 Burris H. Meconium Aspiration. In: Cloherty J, Eicchenwald E, Stark A, editors. Manual of Neonatal Care. 7th Edition ed. USA: Lippincott Williams & Wilkins; 2008. p. 429-434. 15 Cases 1 and 2 courtesy of Samantha Choi and Radswiki et el., Radiopaedia.org. From the article “Meconium Aspiration”, found here https://radiopaedia.org/articles/meconium-aspiration. 16 Natarajan CK, S. M. (2016). Surfactant therapy and antibiotics in neonates with meconium aspiration syndrome: a systematic review and meta-analysis. J Perinatol, 49-54. 17 El Shahed AI, D. P. (2014). Surfactant for meconium aspiration syndrome in term and late preterm infants. Cochrane Database Syst Rev. In up to what percentage of pregnancies does aspiration of meconium stained amniotic fluid occur? What is MAS characterised by? When does the gestational age become a risk factor for MAS? In a newborn infant, tachycardia is characterised what heart rate? Approximately what proportion of newborns with MAS have associated persistent pulmonary hypertension (PPHN)?